As a Hall of Fame player and an executive for the reigning Stanley Cup champions, life in Los Angeles has been pretty good for Luc Robitaille. More than 25 years since arriving in Hollywood, the notoriety has afforded the hockey icon some unique opportunities. 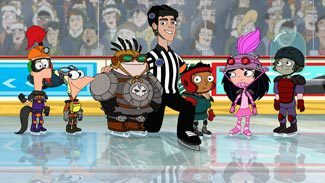 The latest has the Los Angeles Kings' president of business operations appearing on the season premiere of the popular animated children's program "Phineas and Ferb," shown by the Disney Channel on Dec. 7. "It was a lot of fun. The guys over there are big hockey fans. It was fun to be there," Robitaille told NHL.com. "These guys made it really easy on me; it was cool." Robitaille admitted he wasn't familiar with the show, which has had guest appearances from Tina Fey, Michael J. Fox and Kevin Smith. Robitaille agreed to do it at the urging of his assistant, Kehly Sloane, whose son is a big fan. For the creators of the series, which premiered on Disney in 2007, it was a thrill to have the legendary Kings player on the program. "When we started planning a hockey-themed episode, we knew we wanted to include a real legend of the sport. Luc just seemed like a natural choice," said Dan Povenmire, co-creator and executive producer. "I'd heard him several times on the radio and knew he was funny as well. [We're] very glad he said yes." Robitaille plays himself in the episode, in which the two main characters seek out advice from the Hall of Famer as they get involved in the sport. To Robitaille's credit, the longtime California resident had plenty of acting experience before coming into the studio to record his lines. The Kings' alternate governor has played himself on a number of shows, including "Arli$$" and "Bones," and lent his voice to the Nickelodeon series "Rocket Power" in 2002, along with NHL peers Jeremy Roenick and Martin Brodeur. Robitaille also collaborates with the producers of "South Park" to produce his annual video Christmas card. But the upcoming appearance on "Phineas and Ferb" could earn him a new generation of fans. "I was shocked. It's amazing how many people are watching that show. Everybody is excited," Robitaille said. "It was fun to see myself as a cartoon character. That was pretty neat." The appearance was Robitaille's latest effort to help spread his love for hockey. For the people behind the show, the collaboration was a chance to rub elbows with one of the sport's all-time greats. "It was a blast working with Luc. He's a genuinely great guy and very patient with the whole process," said Jeff "Swampy" Marsh, the show's other co-creator and executive producer. "We had more than a few laughs at the sessions and I'd be happy to have him back one day. Personally, it was a real honor to have worked with him."